As the business outlook slowly improves for the oil and gas industry, PESA’s 2017 Legal Seminar focused on prospects for and issues surrounding investments in the OFS sector. 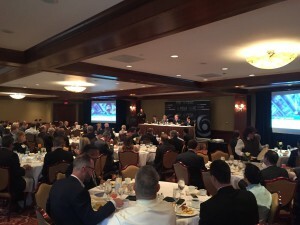 PESA Advisory Board Member Sanjiv Shah, Managing Director, Simmons & Co., moderated a panel of experts that included Vince Foster, Chairman and CEO, Main Street Capital Corp., Bret West, EVP & Division Head Energy Services & Equipment, Wells Fargo, and Daniel Tristán, Partner, Baker Botts. More than 110 members of PESA and the Association of Corporate Growth (ACG) attended the seminar, which was sponsored by Simmons & Co. and held May 17 at the Houstonian. Shah opened the program with an overview of the market and recap of recent IPO and M&A activity. IPO activity had been minimal during the last few years, but since October 2016 there have been eight deals and current runrate for the year would suggest 2017 will close out with 15 IPOs. On the M&A front, generalist private equity drove an increase in M&As during 2013 and 2014, but with the decline in energy prices, M&A deal flow has declined substantially during the last few years. Looking to future activities, Shah believes there is ~$80B of dry powder private equity capital cash reserve poised to invest in the U.S. energy industry. Panelists then addressed a wide range of questions. Assessing the current landscape, Foster expects banks and other lenders to return to the market when they see stable situations and will tend to avoid loans to rapidly growing companies. West believes the investment outlook feels much better today than just six months ago, but the sector is still not yet out of the woods. In the near-term, investors will likely continue to focus on the high-yield market and asset-based lending. Tristán is cautiously optimistic, but that may change if OPEC decides to increase production at its May 25 meeting. As shale operations pick up, West believes operators will continue to focus on improving efficiencies and reducing costs. Smaller companies will have a difficult time competing and attracting capital; in turn, this will lead to more consolidation in the OFS sector. Foster’s clients are particularly interested in companies that operate in the infrastructure area, while they tend to avoid investments that are solely tied to drilling operations. Another key focus area for E&P operators is increasing recovery. OFS companies that offer technology solutions increasing ultimate recovery – bigger diameter, straighter, longer wellbores – will be of particular interest to the investment community. The panel agreed that many investors may be sitting on the sidelines waiting to see if the U.S. Congress moves forward with tax reform. Given the complexity in the market, West believes there will be fewer banks engaged in lending to the OFS sector. The speakers provided timely insights which were highly appreciated by attendees. The seminar was hosted by the co-chairs of PESA’s Legal Committee, Brad Eastman, General Counsel – Cameron Group, Schlumberger, and Mark Wolf, Vice President Legal – Subsea Services and Surface Technologies, TechnipFMC, Alicia Boston, Senior Counsel, TETRA Technologies, Phillip Shotts, Assistant General Counsel and Director of IP, FairfieldNodal, as well as Michelle Lewis, Chief Strategy Officer, SVP, Corporate Development & Investor Relations, DistributionNOW, who were instrumental in assembling the panel and making the seminar a success.